Living Room Gallery Wall Install! Well, I finally put together my first little gallery wall in our living room! Most of these frames had been collected over the past year, a few like the mirror are even older. To figure out the placement I measured the wall space above my sofa and then measured out the same square footage on the floor. Then I played around with a few different arrangements before settling on my favourite. I thought about doing kraft paper templates to get the spacing right on the wall, but in the end I didn't bother. Using my measuring tape I figured out roughly where the mirror should go and then I referred back to the photo above to figure out the spacing for the rest of the frames. The floral print as well as the oriental print are actually gift bags! When we visited the US I found these gorgeous printed bags on clearance at World Market and I loved them so much I cut them up and framed them - cheap and easy artwork! The papyrus calligraphy is from Egypt, and the other Arabic calligraphy pieces were DIYed. The lower one was a sticker I found at a local store called The Craft Souk, which I mounted on a plaque with some card stock and gold cord. The top print is our favourite line of poetry which I just typed out on my computer. This geometric print was one of my art pieces. I drew the same pattern in blue tones on a card I gave to my hubby on our engagement, but he wouldn't let me frame the original :) The pattern has a special significance for both of us. I love this little grouping! I was so tired of the huge blank wall in our living space and now it's come to life with so much colour. Happy Monday! Hope everyone had a great weekend! We had an amazing time with some family visiting from out of town :) Just before their visit, my honey and I helped my parents spruce up their guest space with a few simple updates and a DIY upholstered headboard! This space in their basement got little attention the last few years, it was mostly home to unused furniture from the rest of the house :) Since most of the budget went to new broadloom and new built-ins (more on that soon! ), we couldn't spend a lot on furniture and accessories. So we DIYed the headboard - for about $50 in supplies and less than 2 hours of work - and made a huge impact in the space! 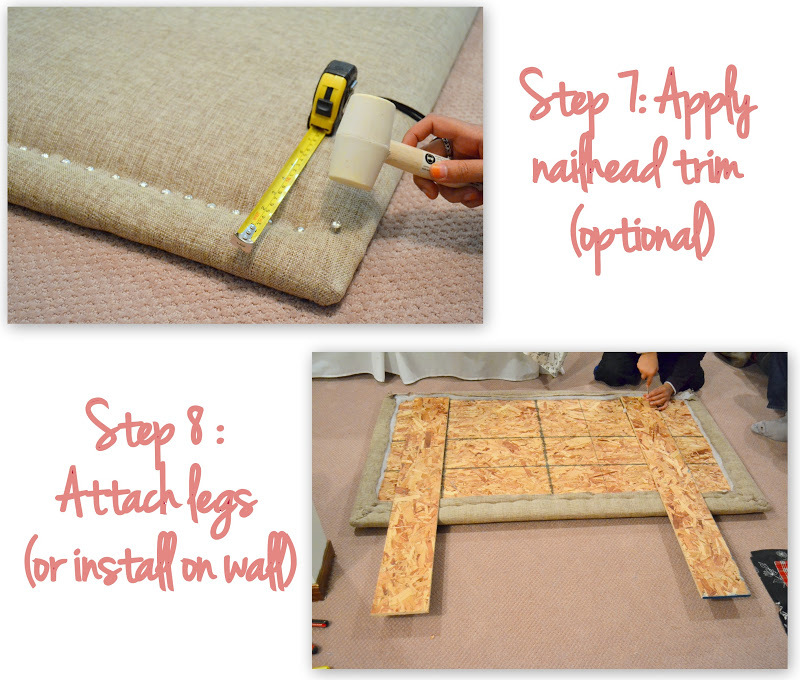 We started by measuring out a size for the headboard. For a queen bed, we went with 62" by 35". We chose an OSB board because it was way cheaper than plywood and easier to staple to, and we had it cut to size at the store. Rather than buying upholstery foam (which can get pricey!) I used a foam mattress pad. The twin size pad worked perfectly. First I laid the foam on top of the board and cut it to size - about an inch larger than the board so it could wrap around the sides and create smoother rounded edges. Next I laid out the layers of the headboard - fabric, batting, foam, and the board. If your fabric has a right side, make sure it's face down, and if it's patterned you'll also want to line it up. You can also glue your foam to the board - we did this with plain old craft glue since we were working indoors, but I realized afterwards it wasn't necessary. 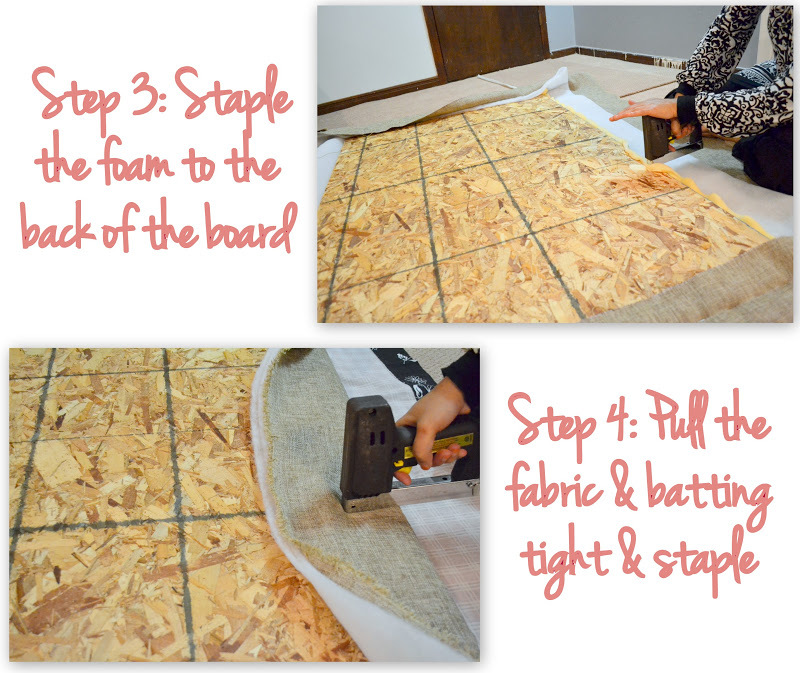 With my foam overhang around the board it was harder to staple all 3 layers neatly, so I stapled the foam first. I pulled it around the back of the board and stapled, and trimmed some excess from the corners. Then I just pulled the fabric & batting tight and stapled to the back of board. I started in the middle and worked my way around, one side at a time & saving the corners for last. To do the corners, I trimmed away some of the extra fabric & batting that was creating too much bulk. Then I just sort of winged it, stapling as close to the corners as I could and using the little flap that remained to create a small pleat. Next I added a nailhead trim with upholstery tacks. You can use pre-made strips of nailhead trim like these, but I couldn't find the right colour in stores and was too impatient to order online :) In anycase, nailing them individually didn't take long at all, and I ended up loving the spacing! I kept a measuring tape on hand to make sure my line stayed somewhat level, but for the most part I eyeballed it. I also went back and redid a few. The trim isn't totally straight and the spacing isn't quite even, but you can hardly tell. The hardest part was that the tacks kept bending, but after a bit of practice I got better. The key was to start gently tapping until they inserted into the wood, and then nail harder to get them all the way in. The last step was adding legs. You could attach your headboard to the wall, but we wanted a less permanent set up. So my sweet husband cut 2 legs from the leftover OSB and attached them to the back of the headboard, measuring the right height and making sure they were level! 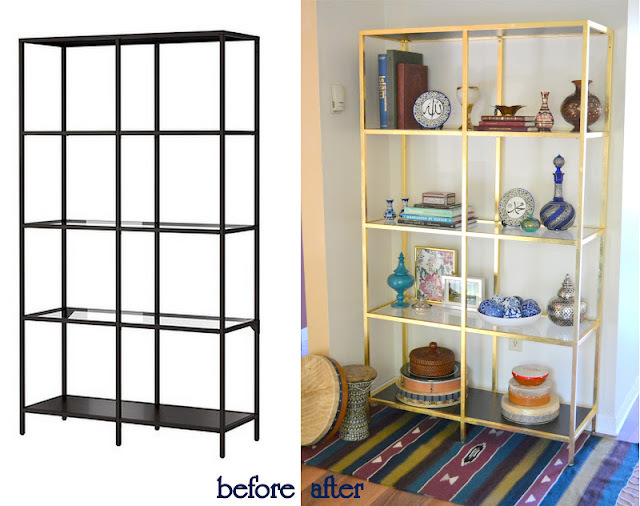 This project was so easy, trust me when I say anyone can do it - I can't wait to do another! 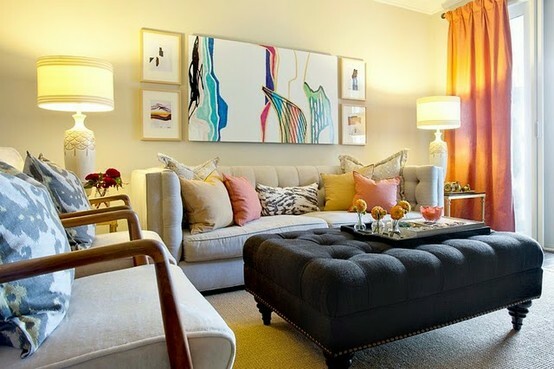 It adds a subtle sophistication to the space, plus it's soo comfy. 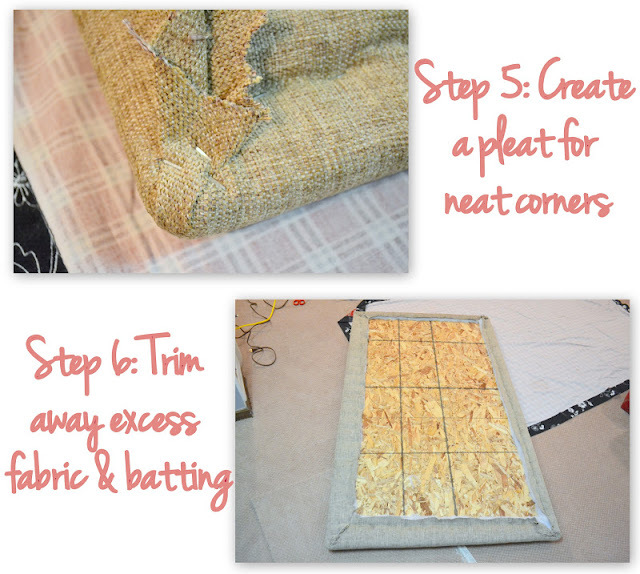 We dressed the bed using mostly linens we had on hand, although I added a bed skirt to hide the old metal bed frame. Other little updates to the space include the inexpensive Ikea table lamp, new cushions for the wicker chairs, and full length curtains that help to soften the look of the room. DIY Brass Etagere – Gold Leafed Ikea Vittsjo Hack! 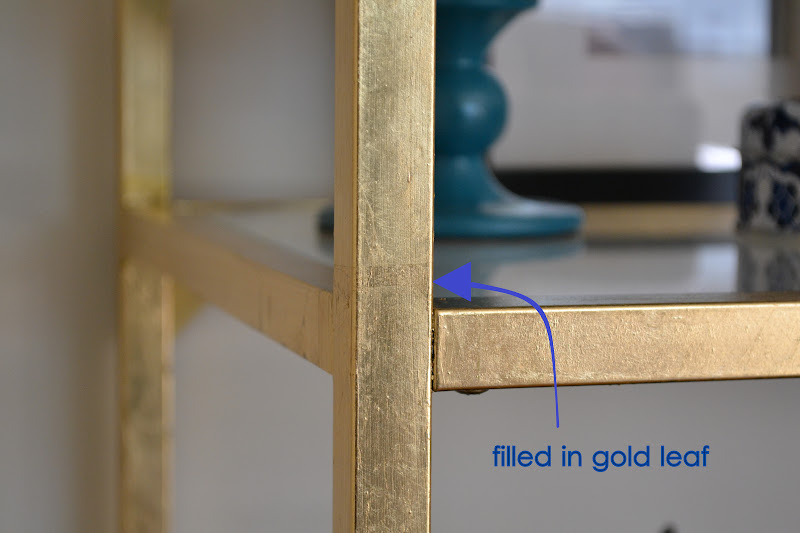 I think etagere is just a fancy french word for shelf, but it’s so much lovelier to say :) Whatever you want to call them, I’ve been crushing on brass and gold étagères for ages. 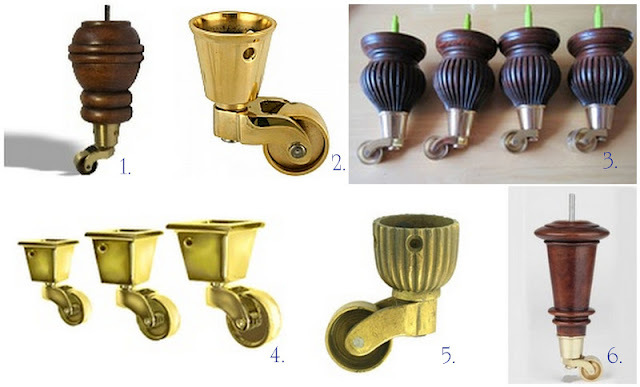 They’re so stylish and elegant and the perfect way to display a few pretty treasures. 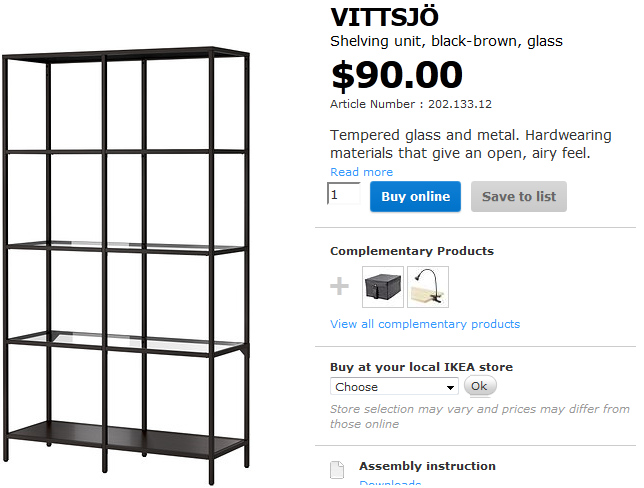 I started with the Vittsjo shelving unit from IKEA. These units come in 2 sizes, for my space I went with the larger one - it's $90 in Canada but only $70 if you're in the US. I love the soft and elegant gold Ana painted her Vittsjos, but I had no idea how to recreate it. 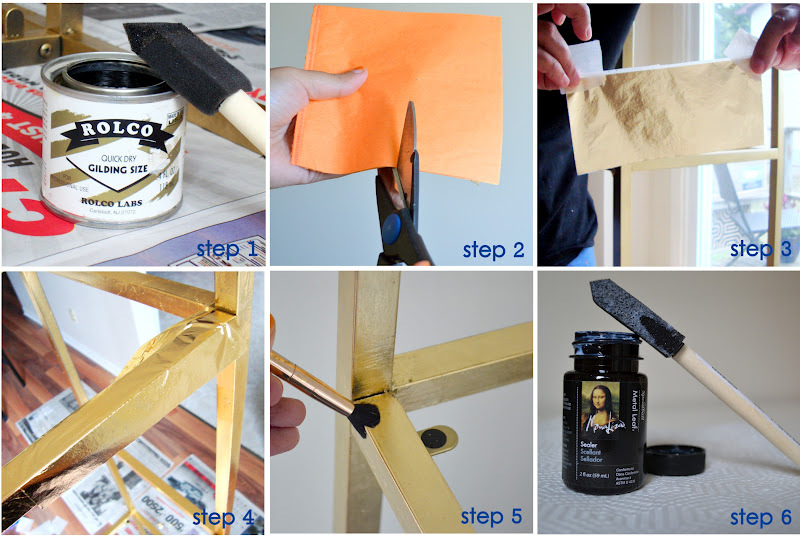 I tested out some different spray paints and initially went with Krylon’s metallic brass. But after a few weeks living with it I was kind of disappointed. The colour was more yellow than I wanted for this project, and the finish was flat. I decided to try gold leaf instead, and I’m so happy I did - this time around I’m completely in love! The finish is smooth to the touch, but it still has a really cool distressed look that I love. Plus it’s more reflective than paint (which was just sort of glossy), giving the étagère a metallic effect. I love that bit of sparkle that it adds to our living room! Plus after moving into this home we moved our bookshelves upstairs to the study room, so I like the height of this piece in the space too. Eventually I want to change the bottom and top wood shelves into mirror or glass, but for now I left the original ones. The bottom shelf is housing some of our drum collection. I have to admit, the process was pretty long, and at times a bit discouraging. If you’ve never used gold leaf before like me, think twice before starting on something this big! That said, I did eventually get it done, which also means it’s totally doable with a little time and patience. Before you start, think about doing a few practice pieces in inconspicuous areas (like the back legs). I did a few test pieces to make sure I liked the finish of gold leaf since this was my first time using it. Step 1: apply an even coat of the leafing adhesive (found in my local art shop) with a foam brush, working in small sections. Be careful that it doesn't puddle in the corners! Let it dry until it’s clear and tacky, according to the package, in my case it was about 45 mins. Step 2: cut the gold leaf books in half - half a leaf was plenty to wrap around the thin sides of the Vittsjo. It’s much easier to cut the sheets in the books, or at least between pieces of the wax paper they come in, than cutting them individually. 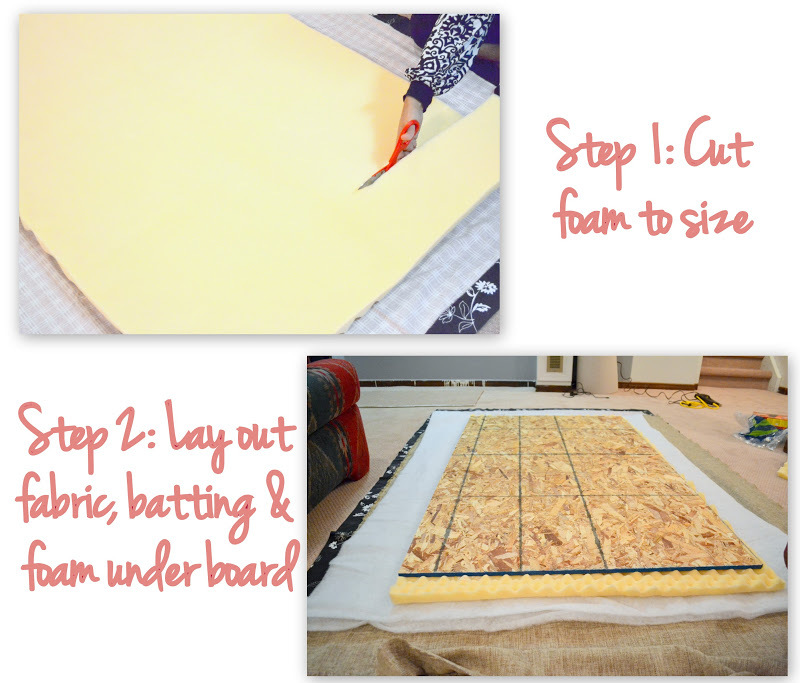 Step 3: lay a sheet of gold leaf (one sheet at a time). Handling the leaf is a bit tricky - if you even breathe too hard on it it’ll flutter away - but after a bit of practice I got into a good groove. The easiest way I found to handle them was holding the leaves using bits of the wax paper. Step 4: gently smooth out & flatten the leaf using the tip of your finger (or a brush, I found using my finger easier, just remember not to use sticky fingers!). As you're smoothing it out, wrap it around the sides of the Vittsjo. Step 5: burnish the gold leaf (basically rub it) to smooth it out, flake away the excess pieces and also buff it up. I used my fingers in some areas as well as a soft make-up brush, which was good for getting into the corners. You can also use a soft cloth. Repeat steps 1-5 until you've covered the whole Vittsjo. You can even do step 5 all at once after leafing the whole shelf. As you work, you’ll likely have some areas where the leaf didn’t stick, which you can go back and redo with some of the bigger flakes that fell off. Don’t freak out about it, my inner perfectionist had a hard time with this, but it’s almost impossible to get a totally smooth application without any little pieces that you have to fill in. The little imperfections are hardly noticeable once you’re done though, and they add to the distressed/textured effect of the gold leaf. Step 6: apply a sealer if desired. It won’t really get a lot of wear & tear, but I wanted to make sure the finish was still somewhat durable, and it only took about 10 minutes to do. This particular sealer didn't dull the finish at all. 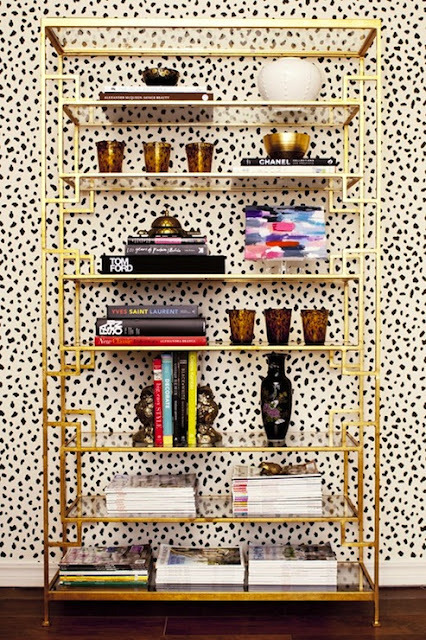 Our new etagere looks great in our living space - reveal of the full room coming soon! While we were house hunting this weekend, my sweet husband made an excited comment that stopped me in my tracks: "once we add curtains it'll really soften the look of the space"
Yes, he said soften. And yes, this is the same man who didn't see the point in getting curtains in our last apartment. This after he asked me a few weeks ago whether we should get "those european pillows", in reference to euro shams. It was a momentous occasion, let me tell you! One of the spaces I've been updating is our living room, and lately I've been thinking of swapping out our center table for an ottoman. We got our coffee table set for free from some awesome friends just after we got married. I knew I wanted to change it eventually but it hasn't really been a priority. Now I'm thinking rather than getting a different table, I really want to do an ottoman. I've always loved the idea of having a comfy place to kick your feet up, and I feel like it'll make our living space that much cozier. I loooove this space from Vanessa Francis of decor happy. A simple tray makes it totally functional as a table surface too. Here are some other ottomans I've been crushing on as of late. 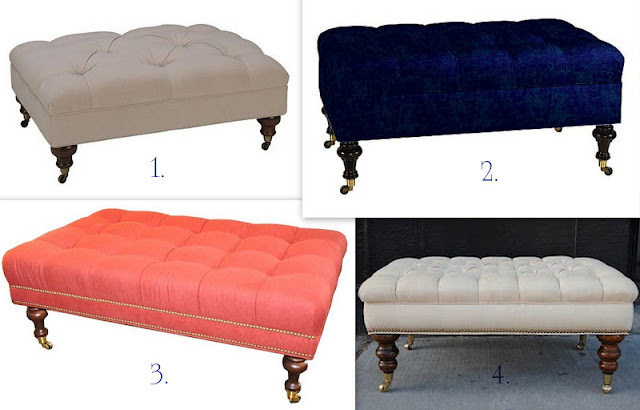 Pretty much all of these ottomans are beyond our budget though, so I'm thinking of a DIY. Building the ottoman shouldn't be too hard, and with some cute furniture legs and castors like these I could totally recreate the look. Sources: 1. 2. 3. 4. 5. 6. So should I go for it? Between our place and my parents house I have way too many projects on my to do list at the moment, but I may just have to bump this one up the list! 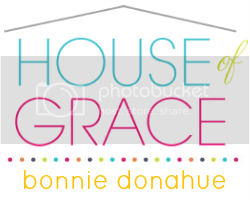 wife, mama, lover of God and design enthusiast. 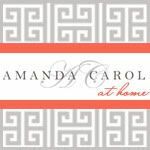 Blogging on my adventures in decorating and DIY, reviving old furniture, family, faith, and whatever else inspires. Thanks for reading!